Quinn has been a regular on Sky Sports for several years. 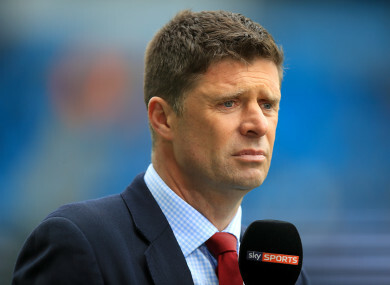 NIALL QUINN HAS announced that he is packing in football punditry for the foreseeable future. The ex-Arsenal, Manchester City and Sunderland striker, who retired from the game in 2002, has been a regular contributor to Sky Sports’ coverage — both as a commentator and a pundit. However, the 50-year-old Dubliner is quitting in order to focus on another business venture outside the media. “I’ve had an amazing time working for Sky Sports,” Quinn said. “The passion and dedication that goes into their coverage is unmatched but sadly I won’t be part of the team this season. “I’m moving on to a new business opportunity and I’ve had to make the tough decision and choose one path and really devote myself to that. I’ll miss the team ethic in Sky Sports — the love of the game alongside the ambition to deliver coverage of the highest quality. Quinn has delved into the business world before with satellite broadband company Qsat, which was shut down earlier this year over a dispute with Avanti. He also had a spell as chairman of Sunderland during the Drumaville consortium’s ownership of the club. Email “Niall Quinn quits role as Sky Sports pundit ”. Feedback on “Niall Quinn quits role as Sky Sports pundit ”.